With the Mountain Biking racing season well underway, let me discuss some lessons we can learn from it. Lance Armstrong did all he physically could as a young man to achieve greatness. He continuously strived for improvement. He did not compare himself to others, for he knew that by doing so he would fall short of his potential. A great businessman must act in the same way. The difference between a good businessman and a great businessman is that the good businessman compares himself against his peers. The great businessman compares himself against himself. He does not stop until he has absolutely nothing left. The beginning and the ending of a race is the time where a mountain biker must exert himself the most. This plays a critical role in the outcome of any race for any rider. The same must be achieved by a successful businessman. He must stand out quickly and noticeably from the rest through his work ethic and determination to get ahead and to be the best that he can be. When mountain bikers are focused on the rock in the pathway, the bike has a bigger tendency to go towards that very rock. When they concentrate on the path ahead they can drive through and past obstacles with greater ease. The same holds true for those who work in business. When they fear the unexpected or dwell on sunk costs they naturally become more and more unproductive. However, if they can look past all the sunk costs and difficult times, then they can find refuge and are much more likely to find success. Sometimes bikers can be a little careless as they ride aggressively through trails on which hikers hike or animals graze. As stated before, because they are in places where there is little access to trash, it can consequentially be fairly difficult to avoid littering. The biker must make a conscious effort to preserve the environment in which he rides. They need to be consciously aware of the environment and try as hard as they can to keep the welfare of the surrounding area in mind. Those who are actively involved in the world of business must abide under the same circumstances. When making financial decisions, it would always be a good idea to take any qualitative factors into consideration. If building a new plant and producing more products will have a negative impact on the environment, the issue must be taken into consideration. The consequences should always be weighed out. 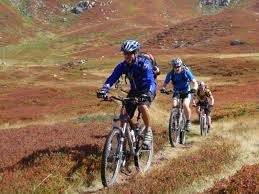 The best mountain bikers are excellent at seizing the opportunity of passing up other bikers whenever they can. Perfecting this technique directly translates into better performance. Those who consider themselves businessmen must act in the same way. Some businessman may have an absolute advantage over other businessman. However, everyone has a comparative advantage and he that finds and incorporates his comparative advantage is well on his way to passing up any other businessmen. Thus, this particular businessman will have the potential to gain greatness and an incredibly high level of success.